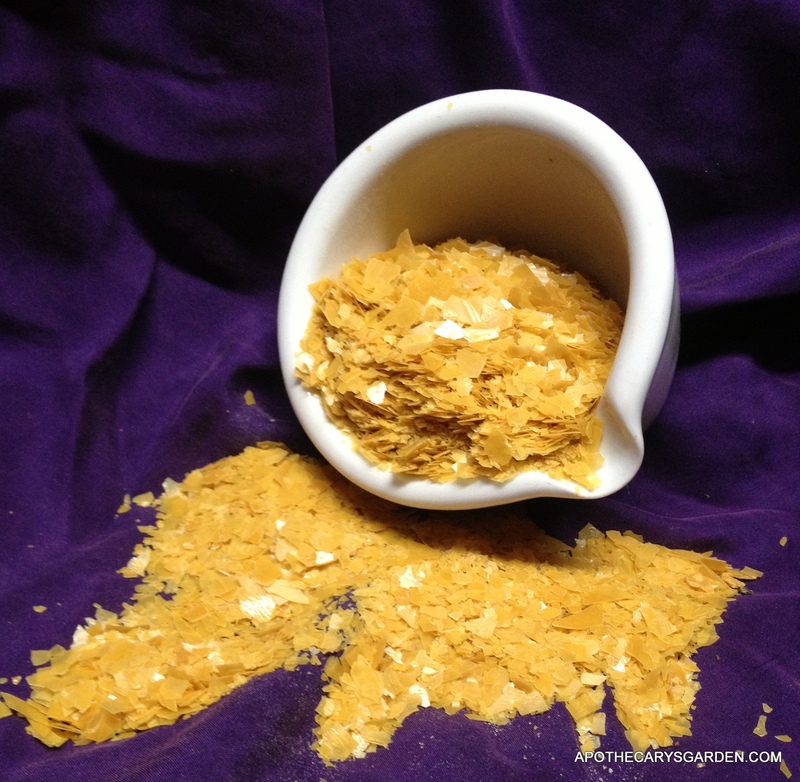 Natural Mustache wax Recipe, Twist and Twirl. Part 2 of “A solid Mustache Wax recipe. 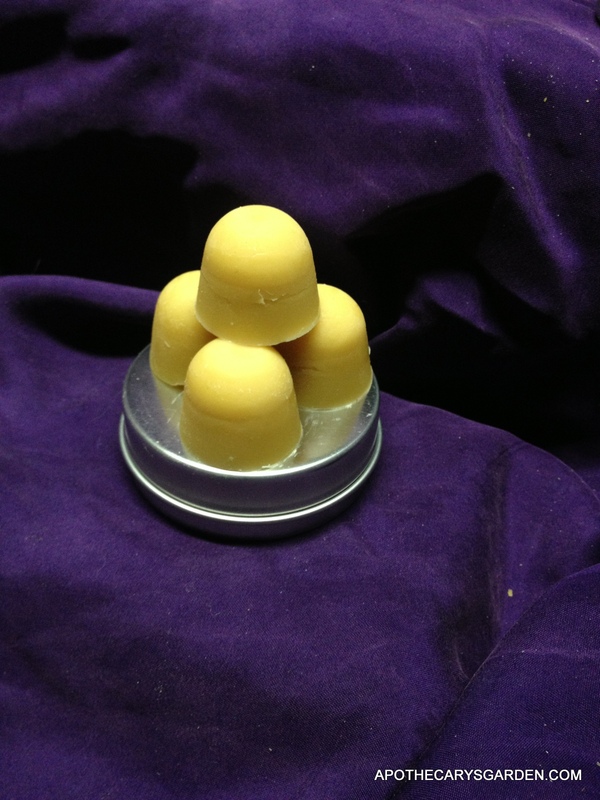 There has been a tremendous amount of interest in the “Solid Mustache Wax Recipe”. Which makes me very happy. so many people are trying it out and making their own personalized versions of a grooming wax, not only for themselves, but for the men in their lives. Men and women are trying out the recipe! How cool is that! Many of us are familiar with the name as an ingredient in high sheen, protective and durable car waxes. Yes, it is a great material for adding a shine or polish, or to protect surfaces, (Furniture too). 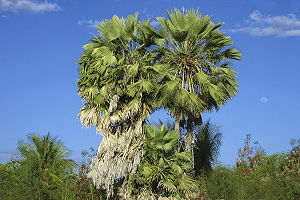 Carnauba wax is a natural vegetable sourced wax that is collected from the leaves of the Carnauba Palm. It comes in light flakes that melt at a slightly higher temperature than beeswax. 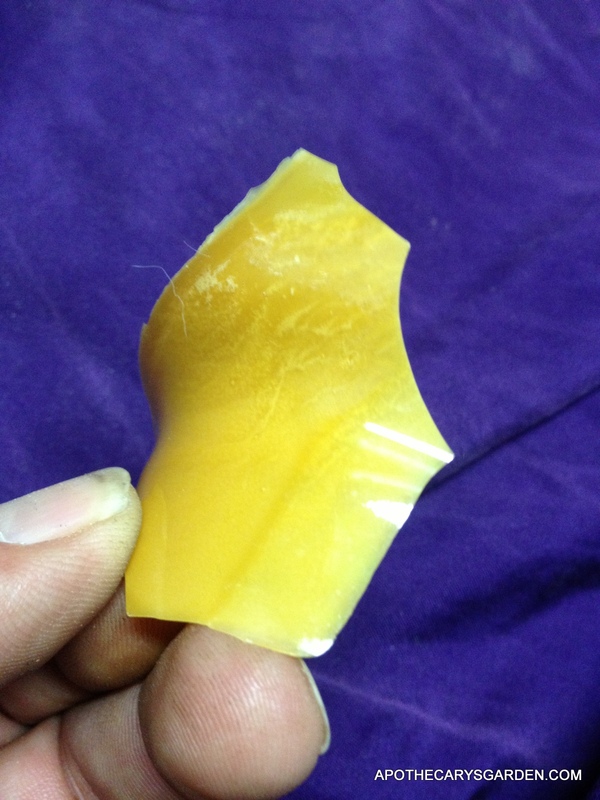 When melted and cooled, Carnauba wax is brittle and hard, almost like a hard plastic. A thin sheet of it will “tinkle” when tapped. before it shatters. That being said, Carnauba wax blended in small amounts to our “Solid Mustache Recipe”, will enhance its ability to create and hold a very tight and well defined twirl. Or a straight horizontal twist, or really, any other mustachrobatics that you can think of! I took some shots of the tight tame twirls it gave my mustache, but the closeups made me feel a little too self conscious! You will have to try it for yourselves. I need a good facial before I can be persuaded to do a close-up photo-op. I don’t know how other men feel about twirls in a mustache, They can be rather sinister, marks of the evil genius, world dominator, local petty dictator. Of artistic eccentricity, maniacal egocentricity, and other dastardly depictions, that us men can be slotted into. However, a tight twirl can also be very distinguished. It can be the perfect innuendo to an untamed bush, lend subtle curves and nuances to an otherwise solid chunk of facial hair. It can create precise definition, a sense of control, direction, and flair that trimming or softer waxes can’t quite pull off. You could pull the length of your whiskers straight out, wrap them behind your ears, or create a decreasing spiral to use up the length you would rather not trim. You could give a 90 degree upward turn with corners as sharp as Stilton cheese, or do some fancy braiding in your beard. (especially if you have some Labdanum!?). If one does not have a lot of upper lip real estate, or the natural materials for a powerful handlebar, the subtle control of a well placed twist or twirl, can make a striking statement without a lot of effort. A case where less can be as powerful as more. That being said, the ability to get and hold a good angle in a handlebar mustache only increases the effect of a heavier mustache, lending more possibilities to explore and more room for play and variety. If religious restrictions do not allow you to shave or cut your facial hair, this is an excellent opportunity for self-expression and creating a little masculine mojo for yourself. Carnauba wax works very well for these uses and due to its higher melting point, keeps its hold for a good length of time. However, there are two things to remember when incorporating Carnauba wax in your Solid Mustache Wax Recipe. Make sure all your materials, especially your Carnauba wax are the same temperature before mixing. If it means waiting an extra 10-15 minutes to be sure the different volumes of materials in your water bath are heated to the same temperature, then wait. The second thing to keep in mind when using Carnauba wax in this recipe is, use a light hand!! You have to create a balance in your mustache wax, where your wax is pliable enough to apply to your mustache, and stiff enough to hold a sharp twirl for the day. Too much will give you a rock hard product more suited to polishing your car. So use the “cold drop” method often, as you slowly add, and thoroughly mix , small increments of melted Carnauba wax to your recipe. Wait for it to properly cool before you test it. Yes, you can always correct it if you overdo the Carnauba, but it is easier to do it right the first time and efficient to keep precise notes the first time through, so you can duplicate your amazing mustache wax when you need to make more or make some for a friend. The proportion I used to give the ideal twirly hold in my experimental batch was approximately 5% Carnauba to the volume,or weight, of the finished product. This means if you are ending up with 500 Mililiters or grams of finished mustache wax, you want to use approximately 25 mililiters or 25 grams of Carnauba wax. As always this is not an exact science, if you have more Shea or Cocoa Butters, more saps or oils, tougher facial hair, you will have to make some adjustments and use a little more. So add your melted Carnauba wax at the end, to a product that works well already, a product you already like. I suggest you melt twice the amount that is called for. I always like to be prepared. Add it slowly, as described above. It is always best to have some left over than not quite enough. In the original recipe 500 grams of beeswax is called for. The ratio of Carnauba wax I would add to the double boiler is 50 grams. This can be done in 2 stages if you like. Create a wax you love using the original Solid Mustache Recipe, then when you have it exactly as you like it, take half of it back to the water bath, set it, and a container with the Carnauba wax up, and create your supercharged edition. If you love it just as much as you hoped, then you can always process the rest of your original batch into the “Super twirl” version”. And if something goes wrong, (Which does on occasion happen in life), you are covered, and still have the satisfaction of having a great original and useable batch of solid mustache wax. Using this method, you will only have 2 containers to deal with in the water bath which will be easier to work with. When both containers are at the same temperature start mixing in the Carnauba wax and testing it till you have the consistency you desire. Using half your finished product, is, in my opinion, the wiser choice, in case something goes wrong and you are not happy with your extra twirly compound. If you have a little experience with these processes, and are comfortable with a water-bath full of containers and ingredients, by all means, feel free to create the product in one shot. One further thought on keeping it simple is, you could try to do it all in one go, with all the original “Solid Mustache Wax” ingredients in your water bath, and simply switch out your tree saps for Carnauba wax. I HAVE NOT tried this! Personally I am very attached to using saps in my Mustache wax. But since nothing is written in stone, you could try using Carnauba instead of pine or Spruce sap. If anyone does try this, I would be very interested to hear how it turned out for them. That’s it folks! If you want to have a great mustache wax, and take it up a notch. Use Carnauba wax in your formula. The Carnauba has little to no fragrance, So when you get your mustache wax smelling exactly the way you want it, the Carnauba will add its magic in the texture, hold and endurance department. And remember to always, always take notes! Your future self will thank you. 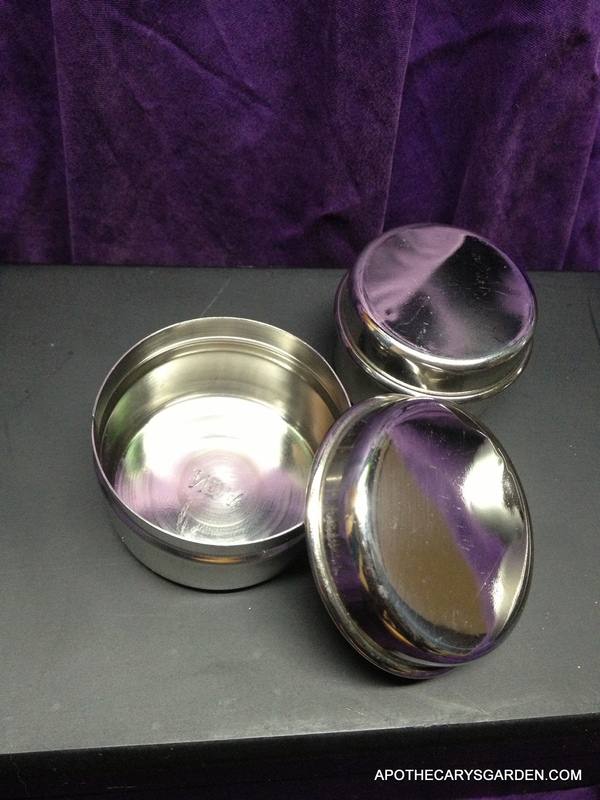 Stainless Steel tins for Mustache Wax-1oz. & 2 oz. 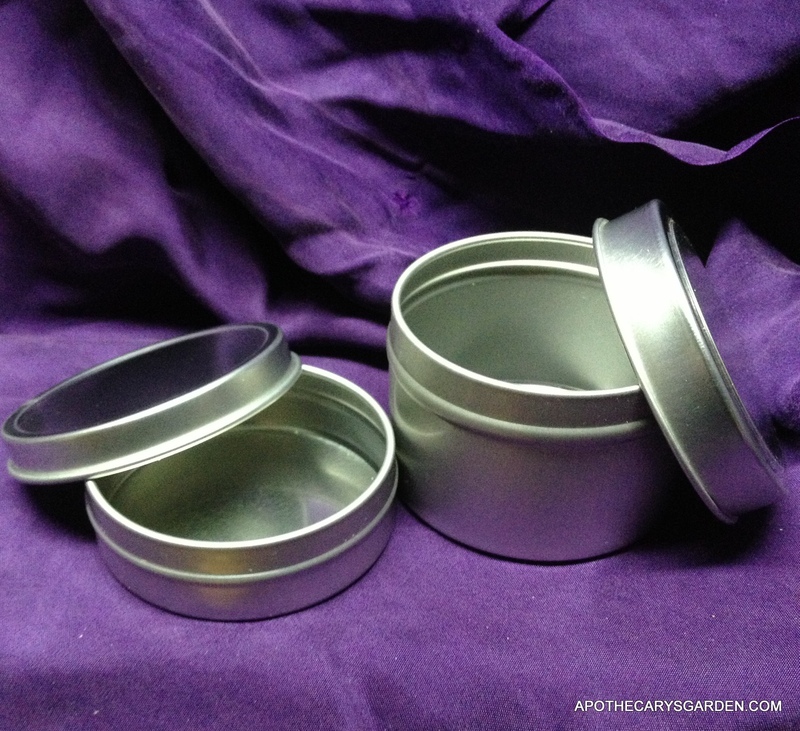 Tins for Mustache Wax 2&4 Oz. Ahh. Thank you!! You know. Without you lovely barefaced yinnies, us hairy yangs might not bother to twirl and spin our little dervishes at all. We would have no one to wax over, ,and could very well just, let it all droop. :-(. And that would be a great loss to everyone. :-).